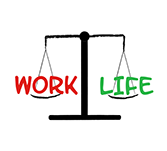 What is Work-Life Balance Tutorial? Work-Life Balance is prioritizing ones career and personal pleasure, family, leisure and religious development. This helps in making to co-exist peacefully with all those areas in our life, in spite of categorized as various spheres. This tutorial is targeted to students and professionals who feels dull and down and shows no confidence in pointing out their opinions and lack motivation towards getting their goals achieved. One should be open to explore and be with calm mindset to follow the suggestions that are mentioned here.